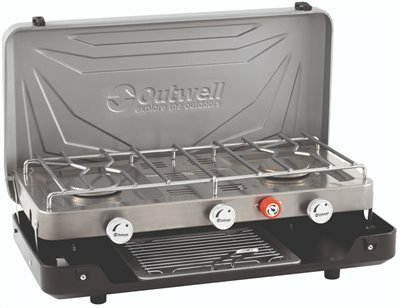 Outwell Chef Cooker camping stoves bring premium quality to outdoor cooking with practical features including rigid, deep embossed lids perfect for acting as windshields; auto-piezo ignition; stainless steel, individually controlled burners and much more. The Habanero design has twin burners and removable griddle plates whilst the Rukutu Stove has twin burners and top grill. The New EN417 Regulator enables gas cartridges to be used instead of LPG gas cylinders. Beans on toast and a coffee for breakfast? The Habanaro stove makes cooking your family favourites easy with this gas-powered double hob and grill. Two individually controlled burners and a grill below offer plenty of cooking options. Anti-slip feet keep the burner stable, and cleaning is no problem with the removable grate and steel surface. Securely connects to an LGP gas cylinder.